Why are two installations necessary? At least two detectors located at widely separated sites are essential for the unequivocal detection of gravitational waves. Local phenomena such as micro-earthquakes, acoustic noise, and laser fluctuations can cause a disturbance at one site, simulating a gravitational wave event, but such disturbances are unlikely to happen simultaneously at widely separated sites. Pasadena, Calif.—An investigation by the LIGO (Laser Interferometer Gravitational-Wave Observatory) Scientific Collaboration and the Virgo Collaboration has significantly advanced our understanding of the early evolution of the universe. It's not just about "mathematical abstraction" but of seeing what good it can be used for. One can be in denial about the prospects but while it gives perspective to current situations, in that it helps to direct thinking forward instead feeling as if "you are just floating in space without being able to move." Helpless are we? Not considering flapping one's wings? Imagine indeed then, trying to orientate direction toward the spacecraft when "floating in space" seems like having to attempt to ride a bicycle for the first time, so one should know we must balance ourselves while doing the appropriate movements directed to where we want to go. It's something that has to be learn in theoretical enterprise while still held to earth's environ? There might be a middle way. String theory's mathematical tools were designed to unlock the most profound secrets of the cosmos, but they could have a far less esoteric purpose: to tease out the properties of some of the most complex yet useful types of material here on Earth. So how has this helped the idea of "minimum length?" So we have a beginning here for consideration within the frame work of Condense matter theorist state of existence? String theory is working along side of to direct the idea of matter formation? Proving that under certain conditions the quark-gluon plasma behaves according to such calculations is an exciting discovery for physicists, as it brings them a little closer to understanding how matter behaves at very small scales. But the challenge remains to determine the properties of the plasma under other conditions. Looking back in time toward the beginning of our universe has been one of the things that have been occupying my time as I look through experimental procedures that have been developed. While LHC provides a template of all the historical drama of science put forward, it is also a platform in my mind for pushing forward perspective from "a beginning of time scenario" that helps us identify what happens in that formation. Helps us to orientate space and what happens to it. It provides for me a place where we can talk about a large scale situation in terms of the universe as to what it contains to help motivate this universe to become what it is. So how did this process help orientate the things that were brought forward under the idea that the universe is a "cosmological box" that people want to talk about, while in my mind ,it became much more flexible topic when Venezianno began to talk about what came before. What existed outside that box. Abstractly, the box had six faces, to which direction of possibilities became part of the depth of this situation. It was a matter indeed of thinking outside the box. I know that for some, why waste one's time, but for me it is the motivator( not God as a creator, but of what actually propels this universe) and to what can exist now that draws my attention. It has been ever so slightly pushed "back in time" to see that the universe began with "microscopic processes that defines the state of the state of the universe in the way it is now." The LHC should be able to answer this although it is still restricted by the energy valuation given to this process. 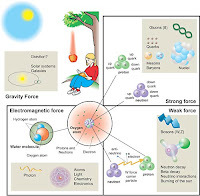 But now, Zaanen, together with his colleagues Cubrovic and Schalm, are trying to change this situation, by applying string theory to a phenomenon that physicists, including Zaanen, have for the past fifteen years been unable to explain: the quantum-critical state of electrons. 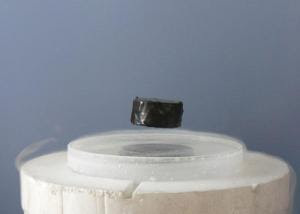 This special state occurs in a material just before it becomes superconductive at high temperature. Zaanen describes the quantum-critical state as a 'quantum soup', whereby the electrons form a collective independent of distances, where the electrons exhibit the same behaviour at small quantum mechanical scale or at macroscopic human scale. A central mystery in quantum condensed matter physics is the zero temperature quantum phase transition between strongly renormalized Fermi-liquids as found in heavy fermion intermetallics and possibly high Tc superconductors. Field theoretical statistical techniques are useless because of the fermion sign problem, but we will present here results showing that the mathematics of string theory is capable of describing fermionic quantum critical states. Using the Anti-de-Sitter/Conformal Field Theory (AdS/CFT) correspondence to relate fermionic quantum critical fields to a gravitational problem, we compute the spectral functions of fermions in the field theory. Deforming away from the relativistic quantum critical point by increasing the fermion density we show that a state emerges with all the features of the Fermi-liquid. 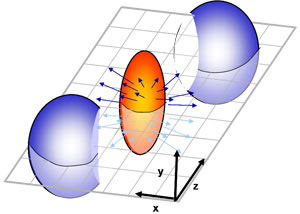 Tuning the scaling dimensions of the critical fermion fields we find that the quasiparticle disappears at a quantum phase transition of a purely statistical nature, not involving any symmetry change. These results are obtained by computing the solutions of a classical Dirac equation in an AdS space time containing a Reissner-Nordstrom black hole, where the information regarding Fermi-Dirac statistics in the field theory is processed by quasi-normal Dirac modes at the outer horizon. 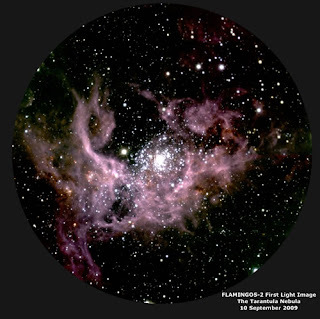 As part of on-going acceptance testing, FLAMINGOS-2 (Florida Multi-object Infrared Grism Observing Spectrograph) obtained first light images on the Gemini South telescope. Several images from this first observing run are shown here (Figures 1 & 2) and demonstrate the instrument’s initial performance. The telescope and FLAMINGOS-2 together produced high-quality images, as good as 0.4-arcsecond FWHM. The efforts of the University of Florida instrument team, led by Stephen Eikenberry, and a large number of Gemini staff made achievement of this important step possible. The initial tasks completed include basic alignment of the instrument with the telescope and initial checks of the functionality of imaging and longslit spectroscopy modes. So while we design our methods of picturing how the universe looks, it is by design of the experimental procedures that we have pushed perspective toward the "depth of imaging" that we design our views of what we propose is happening . So this then is a method based on the Gedankin that allows "an alternate view of the reality" of what is happening inside the blackhole that was "thought of" before we master putting the perspective of what actually happens outside. Analysis of several gedanken experiments indicates that black hole complementarity cannot be ruled out on the basis of known physical principles. Experiments designed by outside observers to disprove the existence of a quantum-mechanical stretched horizon require knowledge of Planck-scale effects for their analysis. Observers who fall through the event horizon after sampling the Hawking radiation cannot discover duplicate information inside the black hole before hitting the singularity. Experiments by outside observers to detect baryon number violation will yield significant effects well outside the stretched horizon. While entertaining the issues put forward by "The Minimal Length in Quantum Gravity: An Outside View" some issues came to mind for pushing forward proposals that are current in science toward identification of how we can look at the inside of a blackhole with information postulated by illumination "outside." 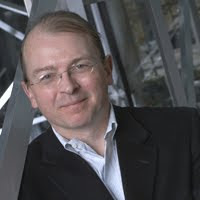 Seth Lloyd is a professor of mechanical engineering at Massachusetts Institute of Technology. He refers to himself as a "quantum mechanic". 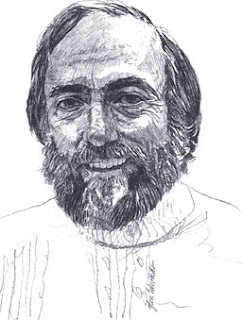 While one recognizes the relationship Susskind had pointed out by doing thought experiments in relation to what processes allow us to search "inside the blackhole" it is information that is "not lost" that allows us to understand what is actually happening with time that moves within the blackhole's internal direction . This then is an "outside perspective" of what is held in contention to Planck's length that we might ask what the heck actually exist inside that we are all speculating about? 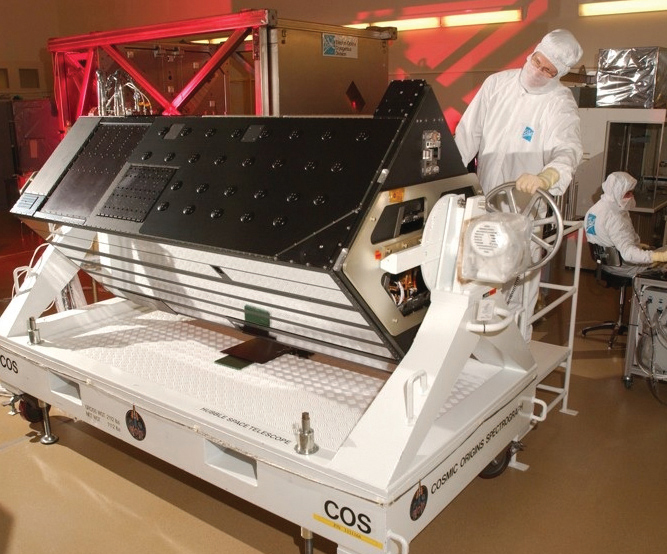 COS is designed to study the large-scale structure of the universe and how galaxies, stars and planets formed and evolved. It will help determine how elements needed for life such as carbon and iron first formed and how their abundances have increased over the lifetime of the universe. As a spectrograph, COS won’t capture the majestic visual images that Hubble is known for, but rather it will perform spectroscopy, the science of breaking up light into its individual components. Any object that absorbs or emits light can be studied with a spectrograph to determine its temperature, density, chemical composition and velocity. Cosmic Origins Spectrograph optical path: The FUV and NUV channels initially share a common path. The first optic is either a concave, holographically ruled diffraction grating which directs light to the FUV detector (red) or a concave mirror directing light to the NUV gratings and the NUV detector (purple). The green ray packets represent the FUV optical paths, and blue ray packets represent the NUV optical paths. A wavelength reference and flat field delivery system is shown at top left (orange ray packets) and can provide simultaneous wavelength reference spectra during science observations. Veteran astronaut Scott D. Altman commanded the final space shuttle mission to Hubble. Retired Navy Capt. Gregory C. Johnson served as pilot. 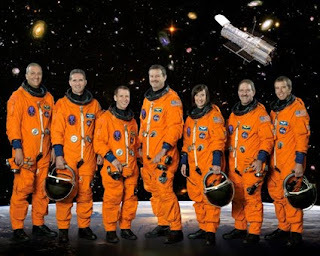 Mission specialists included veteran spacewalkers John M. Grunsfeld and Michael J. Massimino and first-time space fliers Andrew J. Feustel, Michael T. Good and K. Megan McArthur. Atlantis’ astronauts repaired and upgraded the Hubble Space Telescope, conducting five spacewalks during their mission to extend the life of the orbiting observatory. They successfully installed two new instruments and repaired two others, bringing them back to life, replaced gyroscopes and batteries, and added new thermal insulation panels to protect the orbiting observatory. 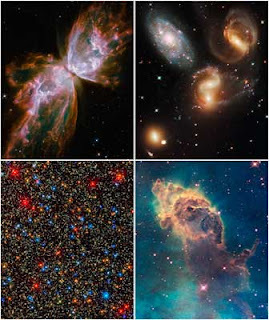 The result is six working, complementary science instruments with capabilities beyond what was available and an extended operational lifespan until at least 2014.
Credit: NASA, ESA, and the Hubble SM4 ERO Team-These four images are among the first observations made by the new Wide Field Camera 3 aboard the upgraded NASA Hubble Space Telescope. Justice, Open to Interpretation While Reducible to Logic? This is the continuance of the proposal toward 21st Century View of Politics and good Government. While I had mention Consumerism this was to point out the supporting structure for elected government frameworks for their idealization supported by the vote of the people. sknguy II:The notion that something is Just is an appeal to the ideas of Justice. And Justice is a personal concept. There is no natural version of the ideas. And Justice isn't a monolithic concept which a particular person or group can recite as being a true version. Every person, and every generation contributes to the evolving ideas of Justice, or what is Just. The laws we write are a way of institutionalizing the ideas of Justice. And laws are the translation of society's perceptions of what Justice means at some point in time. As our perceptions of Justice changes, our laws change and evolve with it. So when calling things "Just", as in "just society" or "just government", you're appealing to the notion of what Justice means. If you talk about something as being just, you'll have to accept the fact that it'll also be ever evolving and may be inconsistent from one person to the next. And that what "it" looks like today will likely look quite different years down the road. Yes I have been thinking about the way you have described Justice. You have spelt it out very well. I must concede as well to the bold emphasis and recognize it will evolve as you have pointed out. I think though that's my point. What will it evolve too in the 21st Century? I am recognizing all that Justice has become to this point, and in this spirit of democratization asking if our laws have failed in recognition of the swing democracy has taken? Has it? One could contend for sure that all is well and we have come back to what you said about our perceptions of Justice. But the idea then is that such evolution could have contain all the "best of the laws that have been written" have swung in favour of decay and that signs within this interpretation has some value recognized as a foundational truth. Whose Truth? Ah, yes this is very helpful. Some basis from which to work. I have to think about this some more. To this point it recognized that Justice has reached a plateau, and that "Good Governance" is a result of the Laws written to date? If Good Governance is to evolve along with the laws, then the laws will have to change? This then is what we will see in the 21st Century? The concept of "governance" is not new. It is as old as human civilization. Simply put "governance" means: the process of decision-making and the process by which decisions are implemented (or not implemented). Governance can be used in several contexts such as corporate governance, international governance, national governance and local governance.See:WHAT IS GOOD GOVERNANCE? Governments then shall represent the following eight characteristics of Good Governance and if any these Governments show lacking in any of this interpretive representations then we shall see where democracy has been slighted by factors of extreme misuse of democracy? From the above discussion it should be clear that good governance is an ideal which is difficult to achieve in its totality.Very few countries and societies have come close to achieving good governance in its totality. However, to ensure sustainable human development, actions must be taken to work towards this ideal with the aim of making it a reality. WHAT IS GOOD GOVERNANCE? What would ratio and percentage applied to Governments of the World(Provincial jurisdictions) be according to policies of Good Governance based on UN interpretation? This could cause disenfranchisement of it's participants while recognizing the idea about the possible definitions of Justice and values assigned to those eight characteristics? While one may of exhausted the challenge of a "logic forming apparatus to conclude in law" what becomes "self evident" comes under the "Aristotelean view of logic." 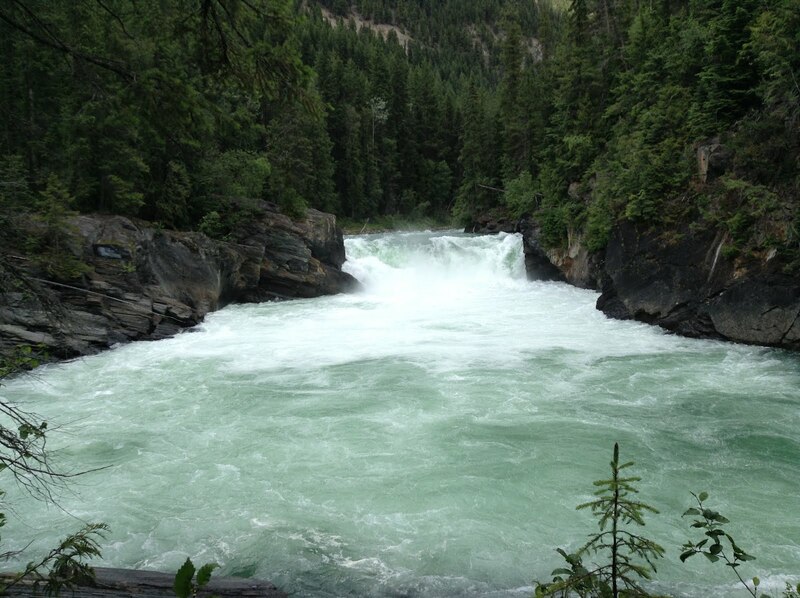 What remains then, is to push forward with an "objective look" for a solution. What appeals to my mind after this exhaustion was to now consider the subject of, "lateral movement" which is to produce "new creative moments" toward idea development for this new "21st Century view" in Law?? This was not inconsistent with Plato's Ideal from idea manifestation toward an ideal per say, but brings us much closer to understanding of the relationship Plato had with Aristotle and the view I am pushing toward the future of societies. One does not discount the process through deliberation with rigour and analysis to arrive at this shift in perspective? Plato's dialogues serve to propel forward writing in the exchanges toward an ideal Plato himself had, yet this is not to say that the constructs development from such exchange could have not warranted , further examination under historical analysis. I understood then the reference to Myths and out of date ideas in reference to previous commenter point on "purely logical or reductionist thinking" related too, the article placed for inspection and relates, Edward_de_Bono-"has set out to challenge the logical, truth-seeking process established by the Greek philosophers 2,400 years ago and cemented in Western culture in the Middle Ages by the church." It would be interesting then to see what Edward DeBono has to say about "justice as an ideal" and it's relation to current laws of countries in place? This to me would suggest that a future forming perspective according to a timeline from the "past to the future" is an evolutionary one and that such a trend in politics would have to coincide with the development of the laws associated with the governance of that country. The concept of "governance" is not new. It is as old as human civilization. Simply put "governance" means: the process of decision-making and the process by which decisions are implemented (or not implemented). Governance can be used in several contexts such as corporate governance, international governance, national governance and local governance. What is the the trademark then of Good Governance? Logic forming and reductionistic thinking has taken us to this point in time. Then such a request to lateral thinking would have to include all that came before Good Governance in order for Good Governance to evolve to what it is today. What Good Governance shall become in terms of it's laws in the 21st Century? ?